I love my readers and I love that so many of you take the time each week to come and link up your fab ideas to share with other parents and teachers. I am also thankful for all of you who don’t link up but do read and use these ideas with your kids. So today I am asking you to link up, share, and to enter for a chance to win an awesome grab bag of craft supplies. Whether you add a link or not you are welcome to enter to win the craft supplies. My longtime sponsor craftprojectideas.com put together an awesome grab bag of some of my very favorite craft supplies they make. This is just a Thank You from me and craftprojectideas.com and all you have to do is fill out the form below the linky for a chance to win. This sweepstakes is open to American residents 18 years or older. To be eligible for the sweepstakes you must enter your name and email in the google form embedded in this post. 1 winner will be drawn at random, using Random.org, after the sweepstakes closes on Sunday, July 14th 2013 at 8:00pm PST. 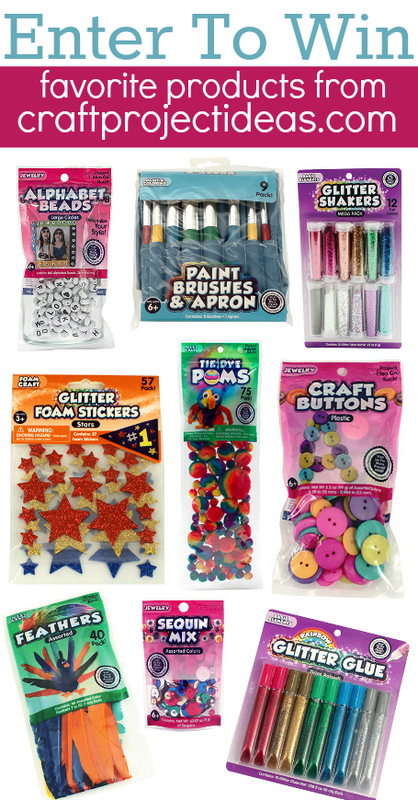 The winners will receive the craft supplies listed above , valued at approximately $50. After the winner is notified he or she has 48 hours to respond with their mailing address for craftprojectideas.com to ship their prize to,or another winner will be chosen at random. No purchase necessary. No PO Boxes. The number of eligible entries received determines the odds of winning. Any information gathered through the sweepstakes including email and postal addresses will not be used in anyway other than contacting winners and shipment of winnings. VOID WHERE PROHIBITED BY LAW. That is a terrific craft collection! Thanks so much for hosting! Awesome giveaway also! With all the rain the past 3 weeks we have been tearing through our craft supplies and need more soon! I have two boys and they are super crafty! Thank you so much for the opportunity to win this treasure! I already have most of these supplies, but I’d love to win so I could give them to my daughter’s classroom. Just found your website today – love it!